It is with great pleasure we present this finely executed portrait of the young and handsome George Flagg Porter (1803-1862). The painting, done in watercolor on ivory depicts him wearing a black coat highlighted with gum arabic, a white collar and stock and a yellow vest with horizontal blue striping. Every detail is finely rendered. 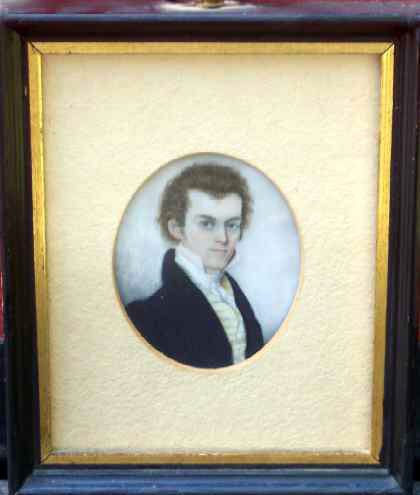 Circa 1820's, he would have been a young man at the time the portrait was done, probably under 20 years of age. 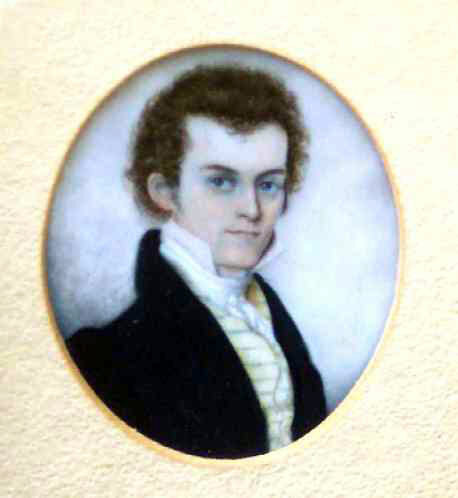 This miniature is one of two that came out of a Michigan estate with another of his wife, Eliza Gove Porter. 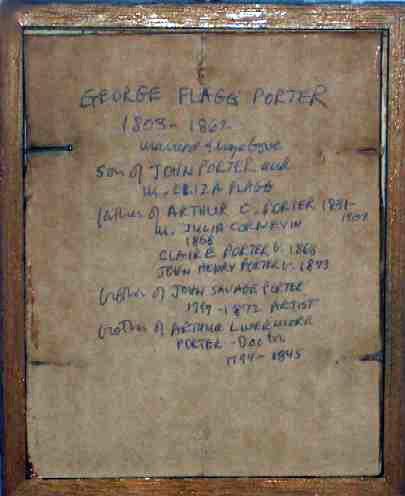 A portion of the family history was written on a piece of backing cardboard and is shown below. The Porter family was an important one in the Detroit area, with members being politicians, physicians, attorneys and industrialists. George was an attorney at law and apparently a successful one as the family employed two servants to help Eliza with the housekeeping as well as the care of the five children from this union. This extremely fine example is in excellent condition with no condition problems whatsoever. The sight size of the painting is 2-1/2" by 2". The frame, which is not period, is 5 5/8" by 4 1/2".